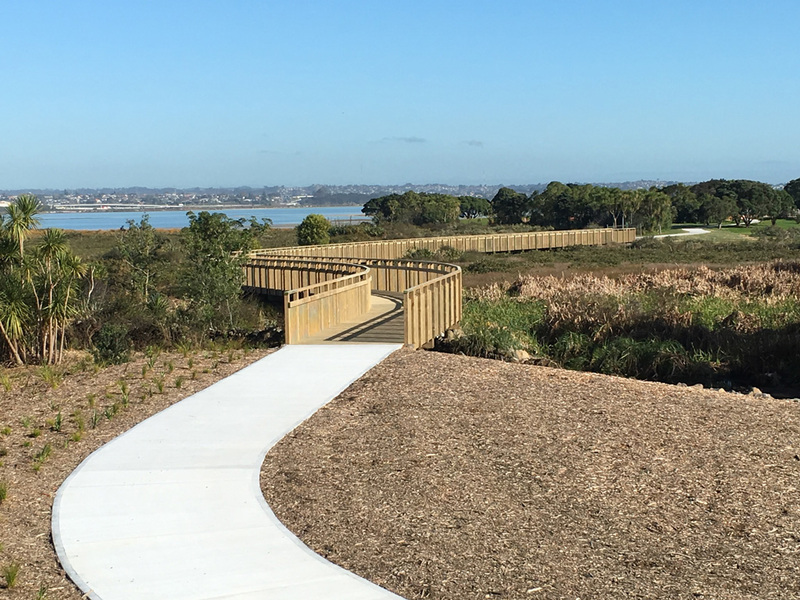 Part of the Waterview Interchange Project, the contract consisted of the construction of a timber boardwalk across a tidal estuary. Programming phases of work around tidal movements was critical to the overall success of the project. The project was broken up into separate work items which enabled us to programme the work items around the tidal movements, including some very high “King Tides”. Works included the timber structure as well as co-ordination of cranage operations and coastal landscaping works. Adjusting our programme of works to assist the head contractor with other elements of the overall contract was also required and accommodated. This was achieved with very little delay to our contract. Construction access was also required to be shared with other contractors as the works were needed to be isolated from the existing native coastal birdlife in order to protect the relevant nesting areas. Time: Programme was critical to the client, as temporary staging was required to be removed by a certain date to comply with the resource consent. Budget: The contract was completed on budget. Some minor variations were approved due to changes in design, however the budget was contained within the expected contingency. Performance levels: All performance criteria were met on the project. All stakeholders are happy with the final outcome of the project. All QA criteria were met, with significant environment and heritage constraints being catered for. Health & Safety and Environment: Stringent Health and Safety Practices by Asset Construction Limited, have ensured no LTI’s or First aid injuries to date. There were no environmental issues as significant effort was made to isolate the concrete pours contaminating the estuary as well as containment and disposal of timber waste offcuts, sawdust and wood shavings through the use of tarpaulins and timber trimming/machining off site. Coastal bird nesting areas were kept isolated from the works through the use of barrier fencing. Responsive to Client’s Needs: The client required us to adjust the staging of works to assist with their overall programme requirements. Resources were adjusted to suit the overall programme requirements. The client was very happy with the standard of the works and our professionalism, that they added a further stage to the contract.